For PRICING and QUESTIONS about these Indian Baskets, Indian Artifacts, Stone Artifacts or Antique Photos, please contact Gene Quintana Fine Art. Cash Paid for all Indian Baskets. In need of identifying American Indian Baskets, Basketry or Artifacts? Gene can help you with identification on individual pieces and collections. FOR SALE - A RARE OPPORTUNITY! Louisa Keyser (Datso-la-lee 1835-1925) a Washoe Native was the greatest weaver of all time. From Abe & Amy Cohn's Emporium Company in Carson City, Nevada, as well as their curio shop at Lake Tahoe, Datsolalee, created masterpieces in basketry from 1900-1921. These baskets were Amy Cohn's personal collection direct from the hands of Datsolalee. 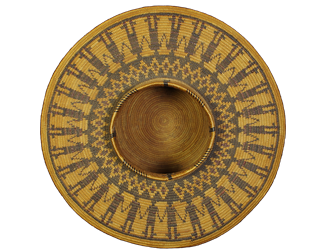 Please browse our catalog of Native American Indian baskets and artifacts to see all the Indian Baskets representing many of the Native American Indian Tribes. Many of these Indian Baskets are from the mid to late 1800's and early 20th century. The Indian Basket styles include ollas, bottleneck baskets, trays, bowls, treasure baskets, hats, cradles and miniatures. The baskets feature objects, symbols and creatures found in the everyday lives of Native American Indian Tribes. All our Native American Indian Baskets are of fine museum-quality and would be beautiful additions to any Indian Basket collection. Several of these baskets have been featured in books and other printings about Native American Indian Baskets. In addition to these Indian Baskets, we also have many fine and rare Native American Indian Artifacts, Indian Collectables, and Native American Stone Artifacts. We also buy Indian Baskets, Indian Basket Collections, and Native American Indian artifacts.